It can be tough amongst the multitude of gardening services out there, to find conscientious gardeners with real passion for their work and gardening professionals who really care about providing great customer service to each and every customer. At London Gardeners our fantastic gardeners have developed a fantastic reputation in the city for providing the very best lawn care, landscaping and a wide range of gardening care services to residential, domestic, commercial or industrial properties. Our garden tidy ups are extremely comprehensive and our team of gardeners work so quickly that you’ll be amazed at how soon we will be on our way to deliver fantastic garden maintenance London to our next property. Many people find gardening a real chore and waste of their precious few summer hours, and there also many people who are simply unable to get out and perform some strenuous physical activity, so if gardening really isn’t for you simply call our fantastic gardening professionals on 020 8434 7256 today and we will be happy to take care of your hedge trimming and pruning, garden spraying, lawn mowing, lawn planting, leaf collection, weed control and even garden waste removal. There really is nothing that our talented team cannot do so look no further than London Gardeners for all of your garden maintenance services. 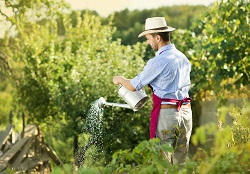 What is really great about our gardening care services is that we are a local company with a great local reputation. We believe that providing great customer service and fantastic work is the best advertisement, and that’s why our satisfied customers are always delighted to recommend us to their friends, neighbours and relatives. We can also provide an extremely flexible pricing structure for our gardening care services to fit into your budget, we can adapt our garden maintenance services to fit your requirements and you can cancel, amend or change your booking at any time if it is not convenient for you. Our regular service will keep on top of all of your gardening work so you don’t have to worry about preparing the garden for this summer’s festivities. You can simply kick back and relax and let us do all of the work. Our talented and experienced gardeners have gathered hundreds of handy tips over their years in the trade so we can save you time and money in the garden with some great techniques. When you work in as many gardens as our gardening professionals do you’ll find that we have picked up some fantastic ideas for the best ways to landscape, craft and create ingenious spaces out of mundane or lifeless backyards and gardens. We are also able to do your patio cleaning too so for any exterior work around your home call us today on 020 8434 7256 to see how we can help. You really cannot find a better service in London and that is because we are widely regarded as the number one service in the city. We can offer the very best work, the very best customer service, the very best flexibility, the very best prices and expert ideas, advice and even free quotations on request. You really have no reason not to choose London Gardeners for perfect planting, comprehensive clear ups, lightning leaf clearance and great grass cutting too. Our proud and passionate service will be delighted to hear from you about your requirements so that we can deliver more great gardens in the city. With experience delivering sensory gardens for the blind and disabled and eco-gardens to support local wildlife we are the only team to call.